Life is full of compromises. DIRECTV’s on-screen guide is legendary for being easy to read no matter what size screen you’re using, but the downside to that is that you usually get about 90 minutes of guide information. That’s enough to see what’s on now and what’s on next but not much more. Did you know there was a way you could see up to 5 hours at a time using the guide? Sure, you only get to see one channel at a time but it makes it really easy to know what’s coming up for the rest of the day. If you had a TiVo in the 2000s you know sort of what this is like, and the best news is that you can do this NOW with your HD receiver or DVR. Start by pressing the GUIDE button. 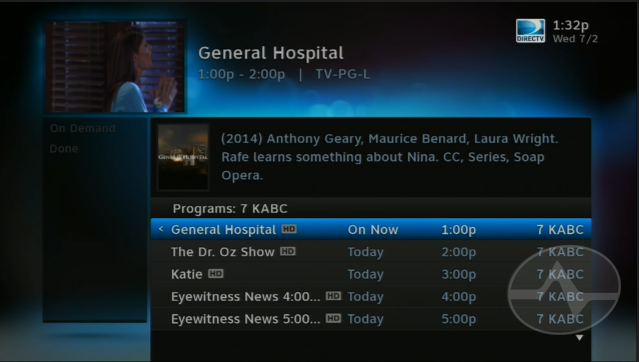 Then find the channel you want to get more information on, and use the left arrow to highlight the channel name. Then press INFO. You’ll get a list of the current program plus the a few more. Then, you can press Channel Up and Down to skip forward one screen at a time. As you can see, the older setup always gave you six programs including the current one. The new setup gives you only four at a time, but gives you extra navigation options at the left side to help you jump to a specific date. This makes it easier to get further in the future. If you’re browsing through the next 24 hours, you’ll end up pressing the button more with the new Genie menus than you did with the old ones. However, if you’re looking further out than that, it’s easier. I guess life is all about compromise. Just like in the guide, you can press the RECORD (R) button to record a single showing or press it twice to record a whole series. You can press the SELECT button to bring up more information including other recording options. This is an easy way to record a whole day’s worth of programs if you are watching a live sporting event or awards show. It’s also a great way to quickly record those episodes in a “marathon” that you want to see, instead of creating or editing a recurring recording for them. Just one more thing to mention… if you want to browse the guide without bothering someone else, there’s a great option. 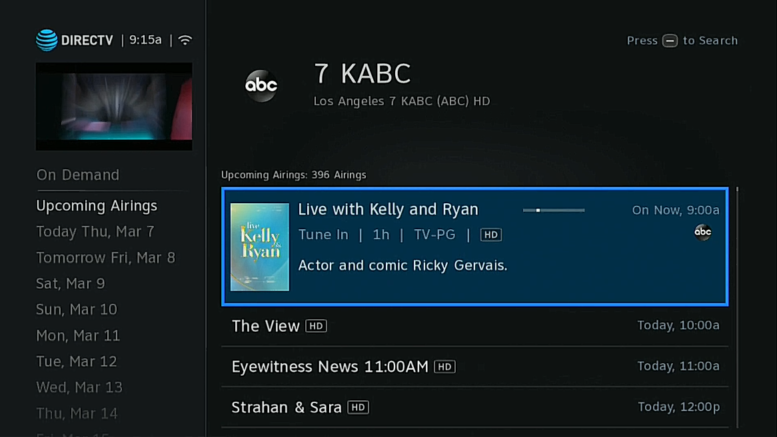 You can look at any time or date, schedule recordings and even view the playlist by using the free DIRECTV app for phones and tablets. Find it at your device’s play store or app store! Once it’s installed, you’ll be amazed by what it can do for you.